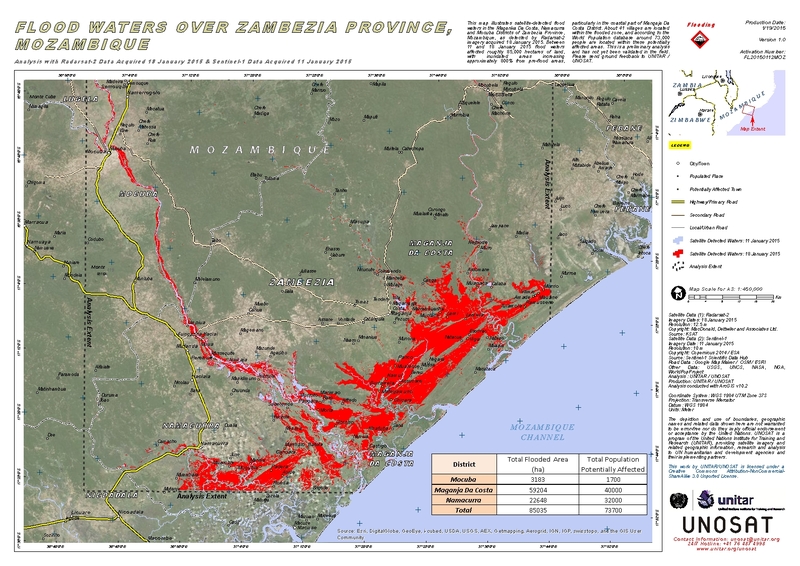 This map illustrates satellite-detected flood waters in the Maganka Da Costa, Namacurra and Mocuba Districts of Zambezia Province, Mozambique, as detected by Radarsat-2 imagery acquired 18 January 2015. Between 11 and 18 January 2015 flood waters affected roughly 85,000 hectares of land, with inundated areas increasing approximately 800% from pre-flood areas, particularly in the coastal part of Mangaja Da Costa District. About 41 villages are located within the flooded zone, and according to the World Population database around 73,000 people are located within these potentially affected areas. This is a preliminary analysis and has not yet been validated in the field. Please send ground feedback to UNITAR / UNOSAT.